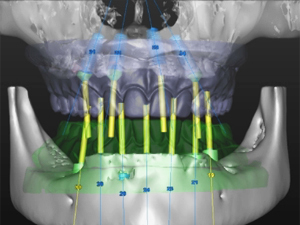 The era of in-office Cone Beam Computed Tomography (CBCT) has unequivocally transformed interdisciplinary dentofacial therapy (IDT). While in-office CBCT imaging may be the latest technological breakthrough enhancing opportunities for treatment planning, it is diagnosis that has remained the constant variable critical for predictable patient outcomes. In the “team-approach” context, surgical specialists are expanding the boundaries of reconstructive surgery and are often called upon to treat more complex bone deformities in patients seeking dentofacial and/or craniofacial rehabilitation. Faced with today’s patient demands, the need for predictable surgical strategies is of even greater importance to ensure successful outcomes. This presentation will discuss and demonstrate the utilization of CBCT imaging from the perspective and scope of a periodontist and an oral and maxillofacial surgeon. Treatment planning, critical thinking skills and surgical execution of cases demonstrating complex dentoalveolar bone reconstruction and craniofacial deformities will be presented demonstrating how this paradigm shift has expanded capabilities and predictability to treat demanding cases.